contest indiblogger split end tresemme Tresemme - say no to split ends! Tresemme - say no to split ends! One night as usual I was virtually strolling online browsing and surfing internet. I randomly visited few websites as a part of my project assignment. As a part of my daily ritual of visiting Indiblogger.in, I happened to bump on to a page which was related to Tresemme hair product. There was Tresemme brand ambassador Diana Penty's picture on that page and she was sporting her silky straight splits free hair on that particular page of Indiblogger. As I read the description, something amazed me. Without thinking much I applied for a sample of this product without knowing much about Split Ends. Gradually, I got busy in my daily activities and eventually I even forgot about this product until one day I got a parcel with a beautiful bag containing two Tresemme product with a card. As I read it, I was taken aback. I read it once again.... SPLIT ENDs! Whaam! What on earth is Split Ends? I quickly googled for this term and I couldn't get much out of it. I tried my sources and even they couldn't convince me with a good answer. But by then I had already given up. I have a short hair and this product was primarily made to reduce Split ends. What do I do? It was the same time my younger sister was discussing her hair problems with mother. I was in the bed room and they both were sitting on the couch in the main hall. She was visibly upset and mother was inspecting my little sisters hair and was applying oil on it. Few hours later I asked my sister about Split ends. She told me everything about it. I quickly offered her the Tresemme Split Remedy Shampoo and Conditioner which I had got few days back from Indiblogger. I assured my sister that her split end problems would get reduced. Since that day onwards she started using it and found the product to be impressive. She even shared it with my neighbor whom we both treat like our elder sister. She applied too and few days hence she shared her experience with us. "I earlier used to be annoyed with myself for not having taken proper care of my hair and that feeling would not let me sleep. Whenever I see my hair branch out, I would cry a silent tear thinking about my hair which I used to consider as a god gifted asset. I never really had a solution to this problem. My husband used to ask me to consult a hair specialist and I had visited most of them but none of them had a good solution to offer. I should thank you for letting me to use your product. This is one amazing product and this definitely works. Now my long hair is silky, straight and amazing! No more Split ends... You both have got me out of a big dilemma. I don't know how to thank you guys! You have been kind enough. 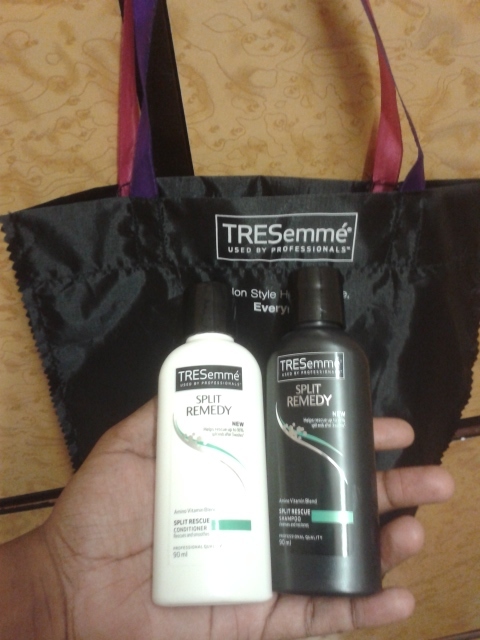 I have got my own Tresemme bottles now and I would strongly recommend this product to my friends and relatives..."
- Ashwini Shetty, my neighbour. "Time Immemorial long hair is often considered to be a trademark for Indian girls. I too love long hair and to me long hair means too much of maintenance. The only issue with long hair is that the split end issue might hurt your hair and make your beautiful long hair ends not-so-beautiful.I used to cut my hair short to get rid of it but every time it used to crop up again. After using Tresemme, I realized that this is the best solution to split end problems and the best thing is that you don't need to cut your hair short! Love you brother for giving me this product!" So now say not to split ends like my sisters Pria and Ashwini said! Love your hair, use Tresemme! Now, it's time to transform!